Graviola (Annona muricata) has 82 different acetogenin chemicals (in 10 distinct types). Mountain graviola (Annona montana) contains the main annonacin chemical that graviola does, and, it has 26 more acetogenin chemicals not found in graviola (in 6 distinct types)! Graviola Max combines both species of graviola (Annona muricata and Annona montana) to provide 12 different types of acetogenins—108 distinct powerful chemicals in all. Compare that to only 28 acetogenin chemicals found in the American paw paw. 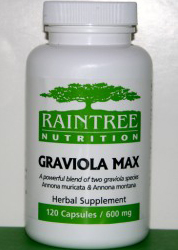 . . Graviola Max delivers almost four times more acetogenins than paw paw! See a comparison of the acteogenins chemicals in all three plants. Don’t forget to see N-Tense capsules which also contains graviola! Please click here to read the Health Sciences Institiute (HSI) on Graviola….It’s staggering! For more complete information on these power plants of the rainforest, please go to the Database file on Graviola. These graviola plants have been sustainably harvested in the Amazon Rainforest. Click here to learn more about our rainforest ingredients and wild harvesting methods. This product contains no binders, fillers, or exipients and is 100% finely milled natural plants. Ingredients: A proprietary blend of graviola leaf and stem (Annona muricata), and mountain graviola leaf and stem (Annona montana). No binders, fillers, or additives are used—just 100% pure plants, rich in the naturally occurring plant chemicals that these plants are regarded for. Suggested Use: Take 3 capsules 3-4 times or as directed by a healthcare professional. Graviola has demonstrated hypotensive, vasodilator, and cardiodepressant activities in animal studies. People with low blood pressure should monitor their blood pressure accordingly.